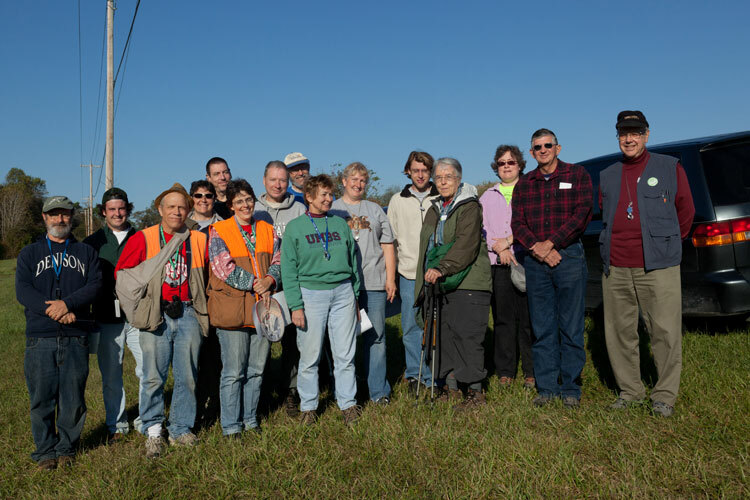 The Summer 2010 foray of the Ohio Moss and Lichen Association, organized by Barb Andreas and Ray Showman, was conducted in Muskingum County, in east-central Ohio. 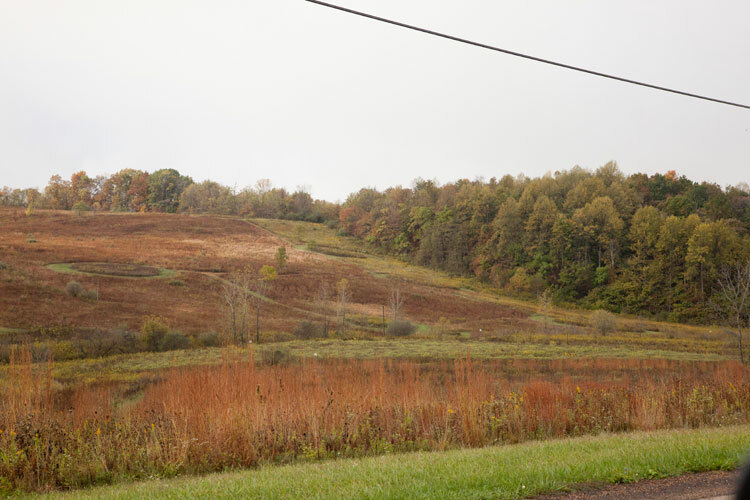 Muskingum County is located in an unglaciated region of the state, underlain by Pennsylvanian bedrock which, having formed during the aptly named Carboniferous Period of the Paleozoic Era, has been the site of extensive strip mining for coal. A wonderful ecological reserve named “The Wilds” is here, and their amazing staff graciously allowed up to stay overnight and work at their lodging and research facilities, and collect on the preserve. The foray was attended by 17 people, including 2 who arrived later, and so were absent from the group photo. Collecting began at a woodland and meadow complex at The Wilds that is also an active research site for a team of scientists studying pollination ecology. Butterfly Woods at The Wilds. October 3, 2010. A number of cryptogams were seen and identified. 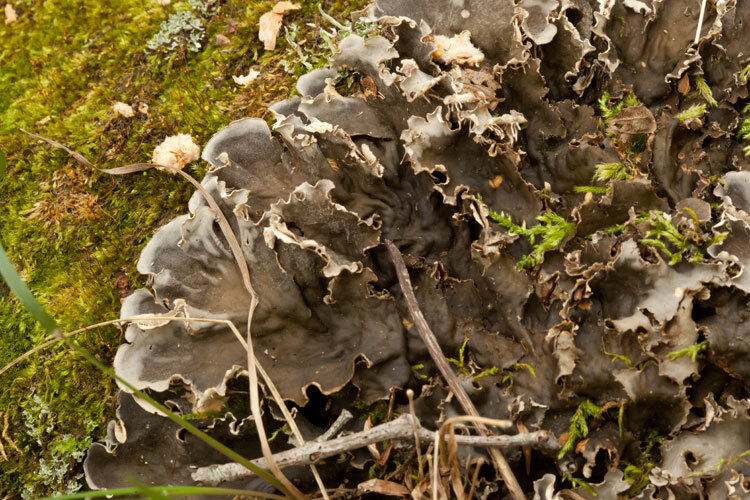 One of them is this fruticose lichen with abundant squamules at its base, from which project elongate pointed podetia beset with powdery soredia. 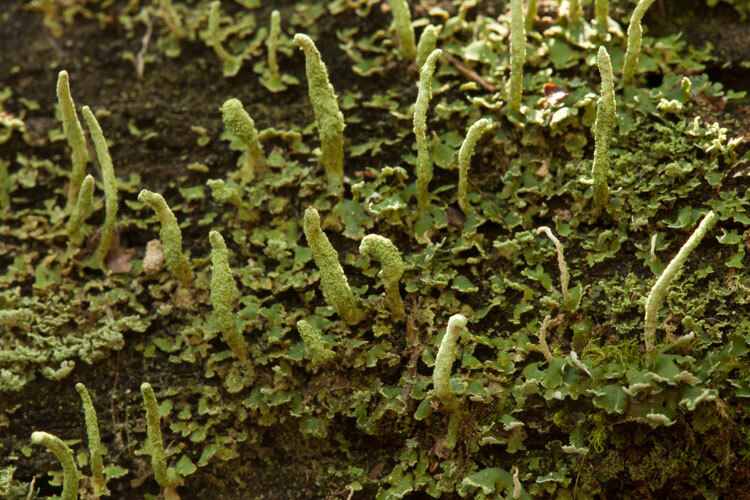 Fruticose lichen at The Wilds. October 1, 2010. After lunch the group went to a remnant woodland where, at its edge, there was an old abandoned oil storage tank, and this almost surreal relict machinery. 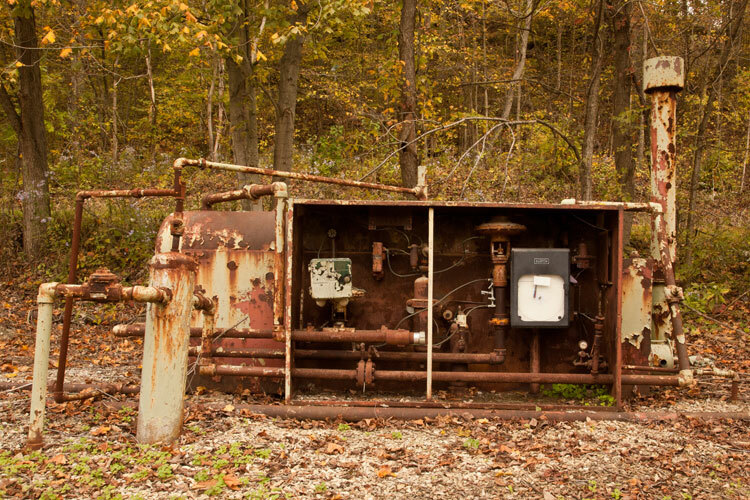 Old oil-tank controls in woodland near The Wilds. October 2, 2010. 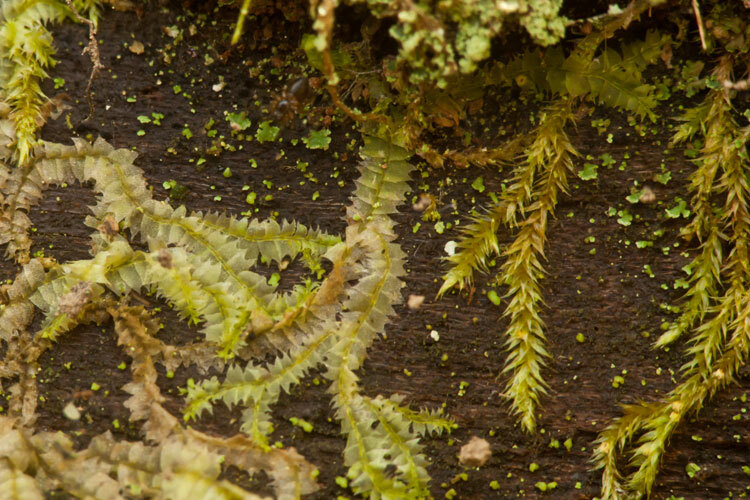 A leafy liverwort seen on a decorticated log is strongly flattened, and has leaves that are emarginate and two-lobed (bidentate). Leafy liverwort in Muskingum County. October 2, 2010. A large lichen with a loosely adnate gray to brown thallus having a cyanobacterial photobiont was seen growing at the edge of a boulder at ground level. Large-lobed lichen in Muskingum County woodland. October 2., 2010. 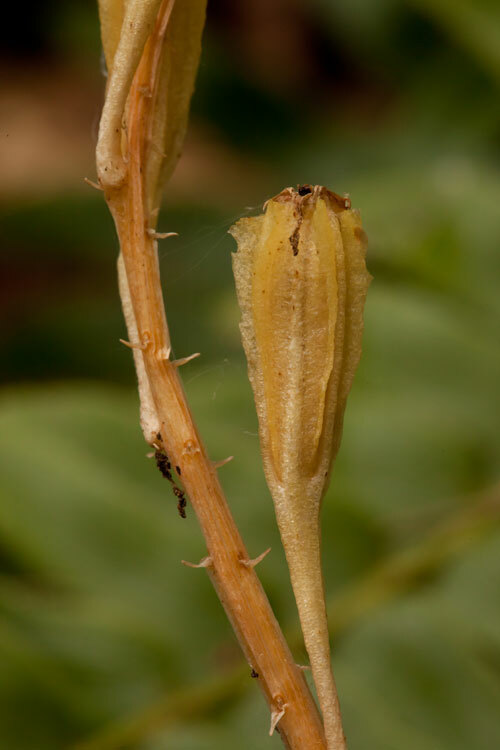 This woodland is home to a few interesting angiosperms in fruit, two of which are orchids. Here’s spotted coral-root, Corallorhiza maculata. Coral-root is a saprophyte, entirely devoid of chlorophyll. Spotted coral-root. October 2, 2010. 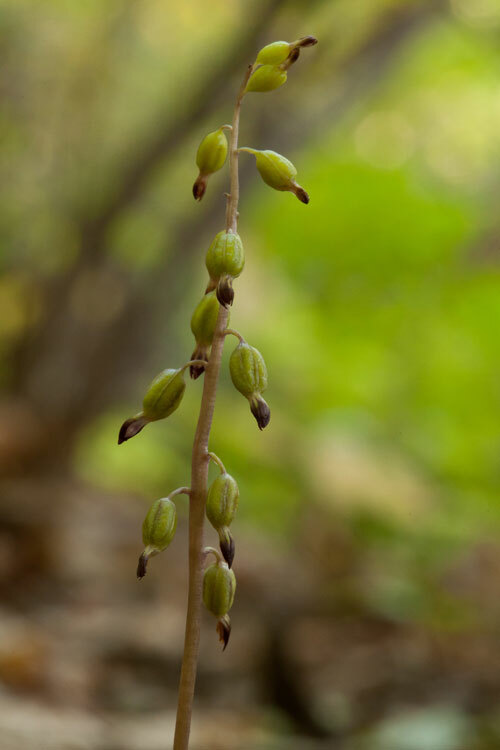 …and this is large twayblade, Liparis lilifolia. Large twayblade. October 2, 2010. In the evening, we settled in to the wonderful The Wilds research station, where we stayed up until the wee hours identifying our myriad finds. 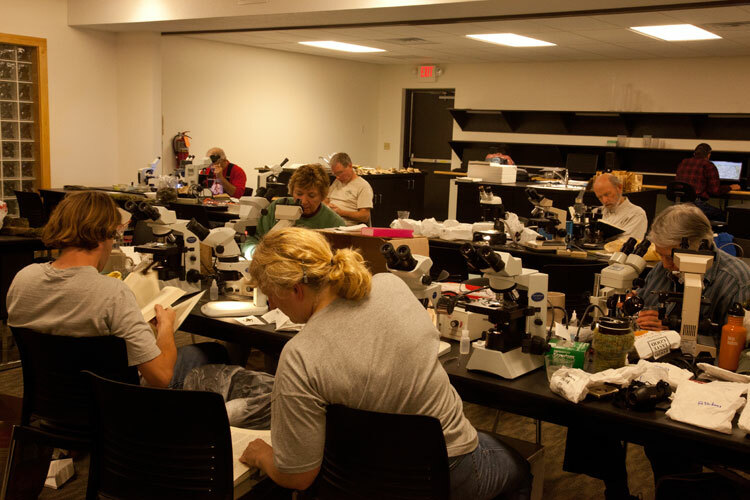 OMLA in the lab at The Wilds. October 2, 2010. 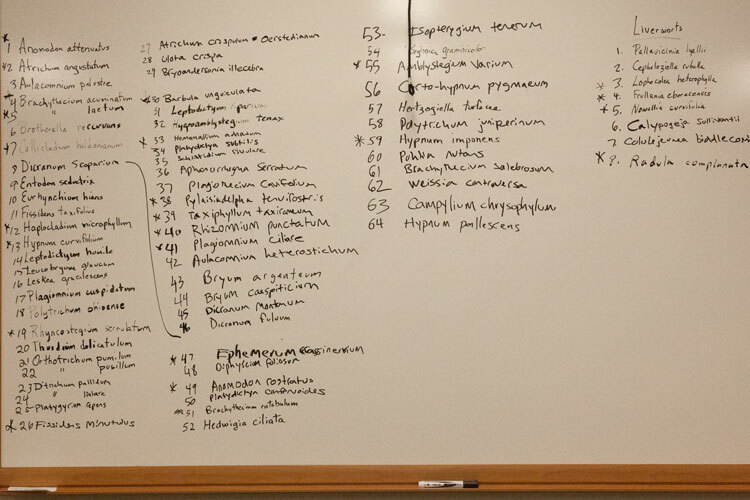 …And by the end of the night amassed quite a list of bryophytes (and lichens too). The following day we visited Blue Rocks State Park. Here, a rich woods dissected by a shale-banked stream provided especially good moss substrate. 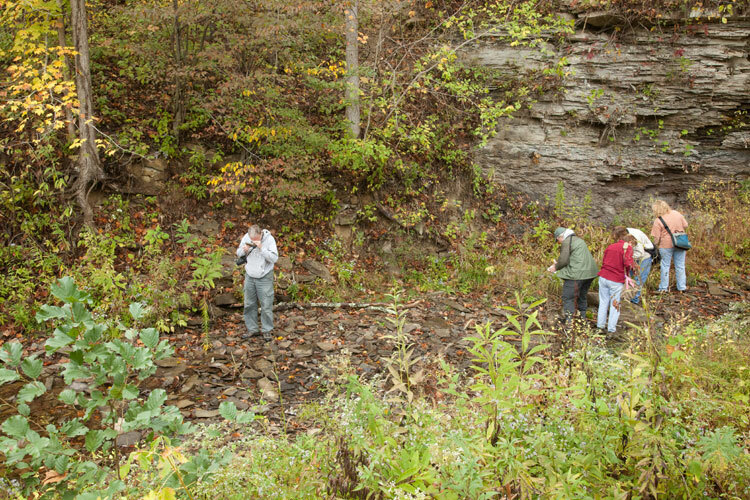 OMLA members explore shale streambank at Blue Rocks State Park. October 3, 2010. 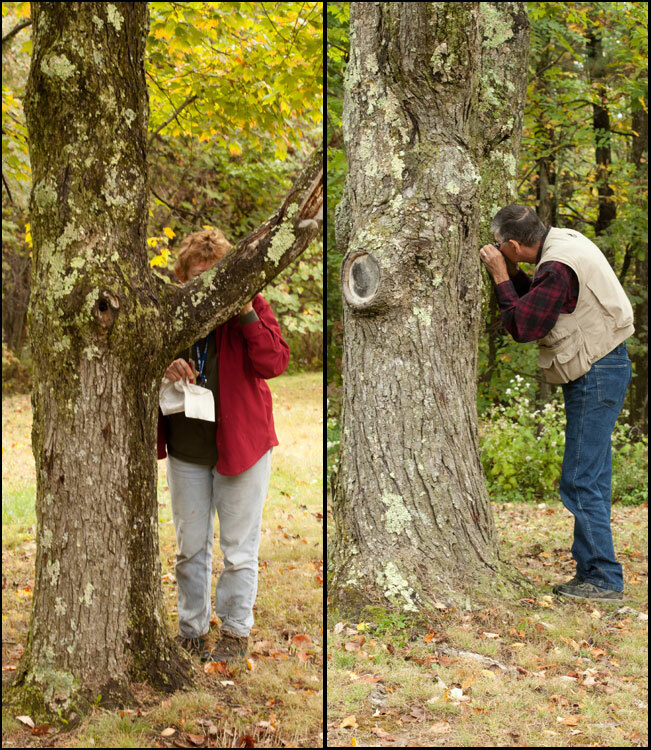 …while better lichen habitats were found on the bark of trees. 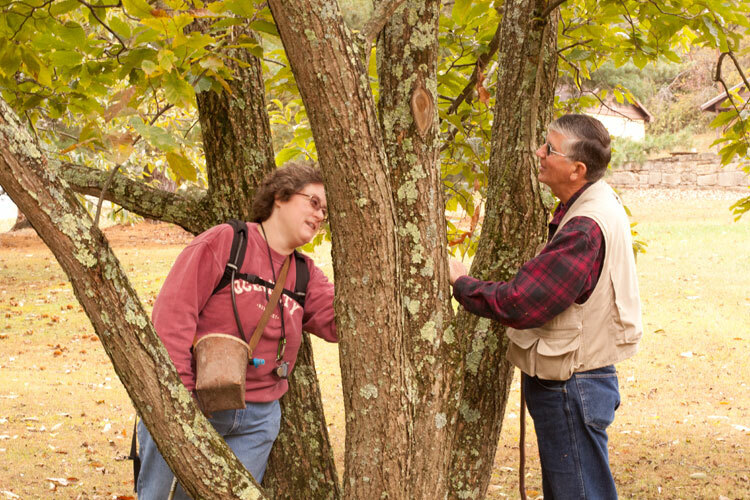 OMLA members examine tree bark for lichens at Blue Rocks State Park. October 3, 2010. 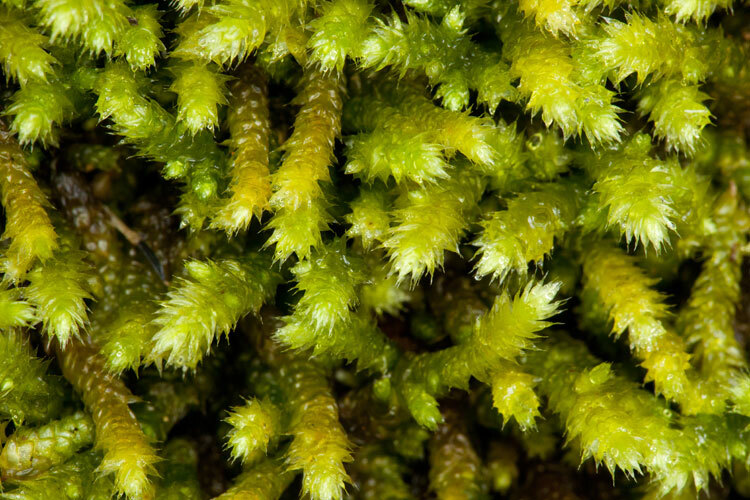 One of the mosses is a robust, light green julaceous pleurocarp found on the soil of a steep bank. A robust julaceous pleurocarp at Blue Rocks State Park. October 3, 2010. Nearby, a planted non-American chestnut tree, probably Chinese chestnut, Castanea mollissima, was in perfect condition, having just dropped a great number of its spiny fruits with delicous seeds inside. These were avidly gathered by several OMLA members, and were delicious! 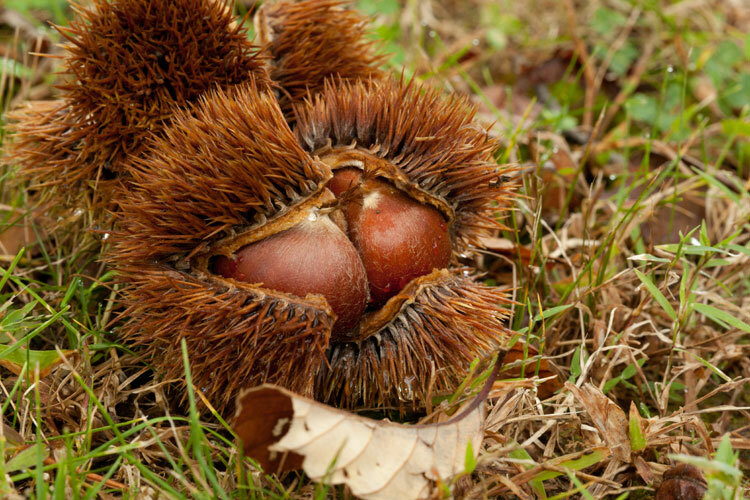 Chinese Chestnut: ouch ouch, yum, yum! Our final stop was the fire tower at Blue Rocks State Park, which afforded a nice view. 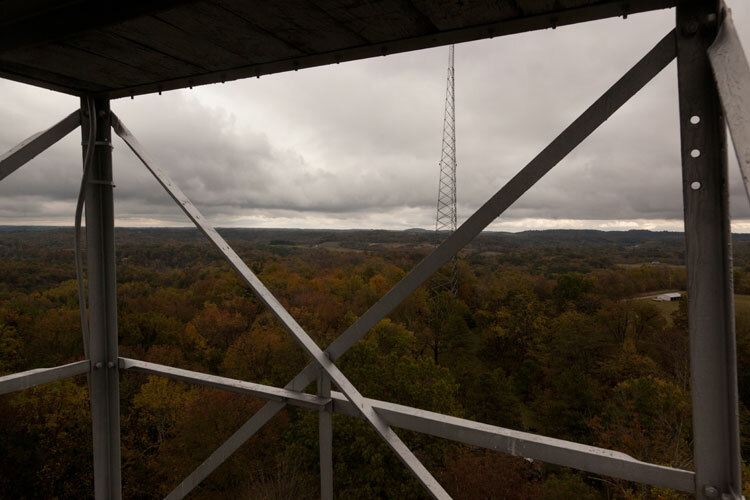 Aerial view of Blue Rocks State park from fire tower. October 3, 2010. 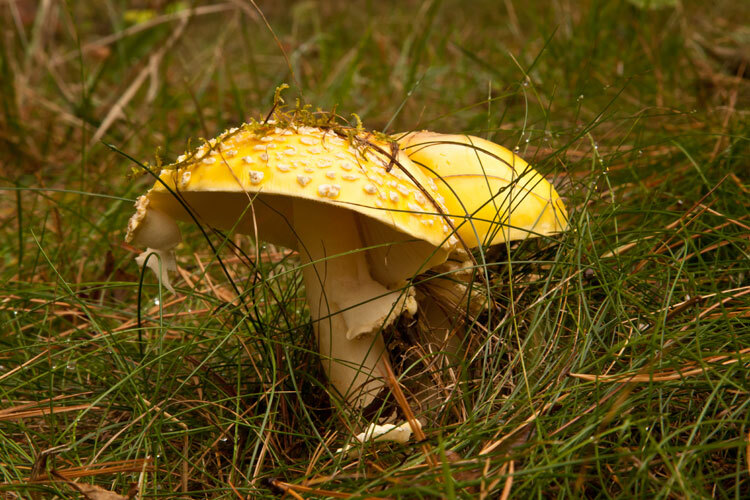 A lawn area here was good substrate for at least one bryophyes not seen elsewhere during the foray, a little strand of which was pushed up by this Amanita muscaria mushroom. Dislodged strand of moss sits atop robust Amanita mushroom at Blue Rocks State Park. Scattered trees here provided good substrate for bryophyes, lichens, bryologists, and lichenologists. People studying cryptogams, expecially corticolous ones, always look dignified! 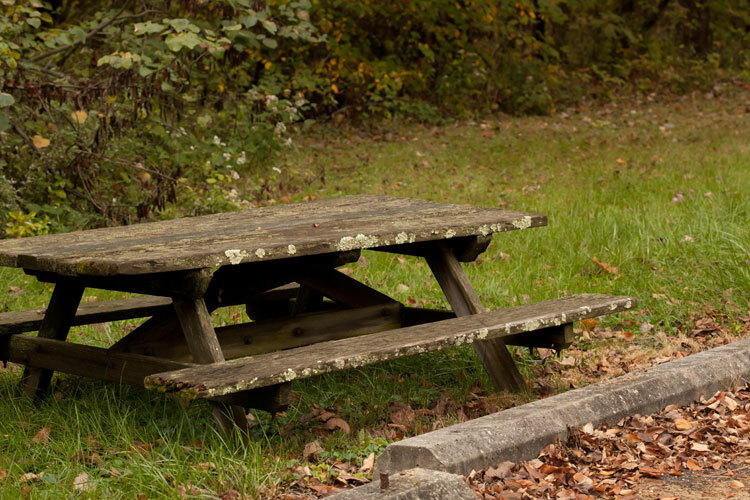 Even man-made structures, such as this wooden picnic table, are colonized by lichens. One of the lichens here is a fruticose one with small sorediate squamules, and podetia also with mealy soredia, tipped with bright red apothecia. Picnic table at Blue Rocks State Park is lichen substrate. 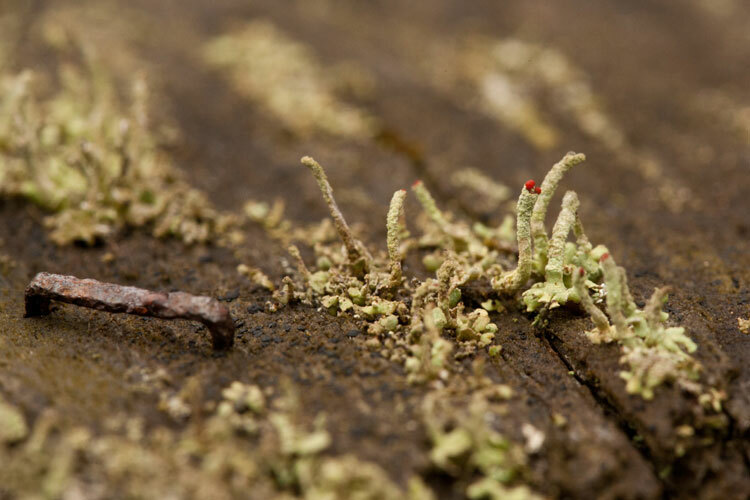 One of the lichens here is a fruticose one with small sorediate squamules, and podetia also with mealy soredia, tipped with bright red apothecia. Fruticose lichen and staple on picnic table at Blue Rocks State Park. 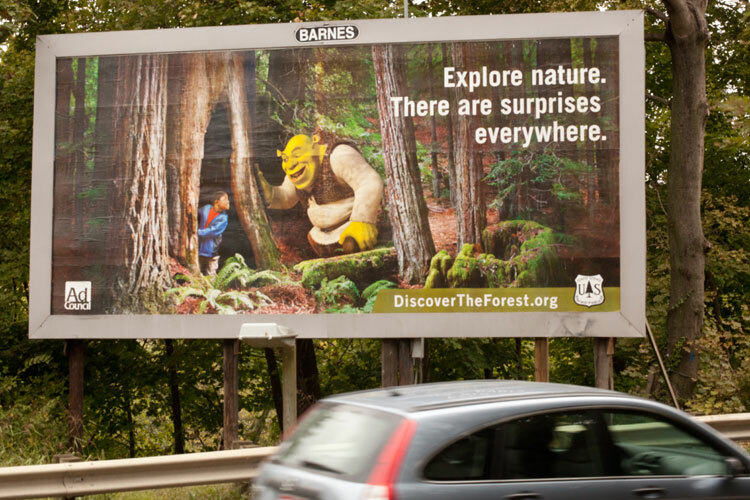 One the way back to civilization, some OMLA members has the pleasure of seeing this delightful sign installed by the U.S. Forest Service. Explore Nature. There are surprises everywhere. Species lists and additional details about the OMLA Fall Foray are in the 2010 OBELISK newsletter.